Mail order rose plants for Sydney and NSW are best purchased in the winter months when plants are dormant. Roses purchased at other time of the year are best sourced from retail nurseries where they can be obtained as potted plants. 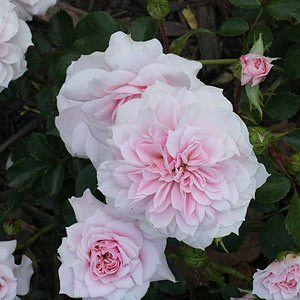 With a very little effort you can have roses such as the Jane McGrath Rose pictured right growing in the Sydney Botanical Gardens, or one of the many other varieties growing in your garden or in a pot. One of the best tips for growing roses in Sydney is soil improvement. Some areas have heavy clay soils which will can dry out in summer and hold to much moisture in winter. Check your soil and if it is that heavy clay try digging in some gypsum as a clay breaker along with some course sand and plenty of compost. On the other hand overly sandy soils will need lots of organic matter to help hold moisture during summer. One of the issues with growing roses in Sydney and Newcastle as well as coastal northern New South Wales is humidity. This encourages fungal diseases such as black spot and powdery mildew. With prevention being better than cure, try to plant roses where they get good air movement, not to close together, and also look for black spot resistant roses. As for pruning roses, in Sydney July is great, and for planting, the best time is in winter. We look at both Retail Rose Nurseries that are located in Sydney that sell potted roses all year round as well as bare rooted roses during the winter months, as well as Mail Order Only Rose Nurseries located outside Sydney or interstate. Most mail order rose nurseries will send roses to Sydney by mail. Rose sent by mail order are usually sent bare rooted during the winter months. Heritage ,David Austin,Hybrid Teas.,Climbers and Floribunda Roses.Rose Quality and suitability is important to us.We send Mail Order anywhere in Australia.